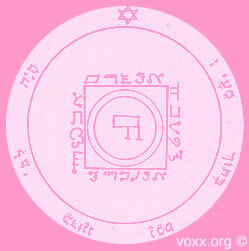 Voxx: The World's Most Accurate Psychic ® | Happy Valentine’s Day! Wishing you all a very wonderful and loving Valentine’s Day! A Note for Singles: Since this special holiday happens to fall within the time of Mercury Retrograde, many of you will be thinking of lovers from the past. Try to keep focused on the love you want to manifest within the coming new year. Attracting Love & Love Spells: In my opinion, the best Love Spell is to simply be loveable! Of course, if you think you’re loveable enough, but need some extra help in attracting a suitable partner, check out a complete list of my Love Spell Kits. The 5th Pentacle of Venus: The magickal talisman found at the top of my post reputedly excites great passion and desire when shown to another. If you’d like to order this magickal seal, or find out about other such talismans, contact me for details!